Barbara Keiler was born on 7 April 1946 in New York, USA. She started telling stories before she could write. She was four when her sister, Carolyn, stuffed a crayon into her hand and taught her the alphabet, and she's been writing ever since. Barbara is a graduate of Smith College, where she learned to aim for the stars, and she received a master's degree in creative writing from Brown University, where she took aim at a good-looking graduate student in the chemistry department and wound up marrying him. She says: "Before my husband and I were married, I had a job in California and he was working on his Ph.D. in Rhode Island. I became ill, and he hopped on a plane and flew across the country to be with me. Neither of us had any money, but he said he simply couldn't concentrate on his research, knowing I was three thousand miles away and facing a serious health problem all by myself. He stayed for two weeks, until I was pretty well recovered. That he would just drop what he was doing, put his life on hold and race to my side told me how much he loved me. After that, I knew this was the man I wanted to marry." Barbara has received writing fellowships from the Shubert Foundation and the National Endowment for the Arts, and has taught at colleges and universities around the country. She has also written several plays that have been professionally staged at regional theaters in San Francisco, Washington, D.C., Connecticut and off-off-Broadway. Since her first romance novel's publication in 1983 as Ariel Berk. She wrote one novel as Thea Frederick, and since 1985 she writes as Judith Arnold. Barbara has sold more than 90 novels, with ten million copies in print worldwide. She has received several awards from Romantic Times Magazine, including awards for the Best Harlequin American Romance of the Year, Best Harlequin Superromance of the Year, Best Series Romantic Novel of the Year and a Lifetime Achievement Certificate of Merit for Innovative Series Romance. She has also been a finalist for the Golden Medallion Award and the RITA Award for Romance Writer of America. Her novel Barefoot in the Grass has appeared on the recommended reading lists distributed by cancer support services at several hospitals. Barbara lives in a small town not far from Boston, Massachusetts, New England with her husband, two teenage sons, and a guinea pig named Wilbur. Her sister Carolyn died of breast cancer in 1998. 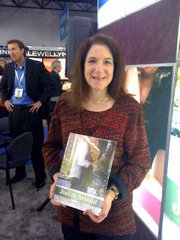 Judith Arnold is currently considered a "single author." If one or more works are by a distinct, homonymous authors, go ahead and split the author. Judith Arnold is composed of 5 names. You can examine and separate out names.